We all clean the living room and kitchen in preparation for guests, but there’s a room in the house that is often neglected. After all, who’s going to see the inside of your closet? Haven’t Worn It in a Year? Toss It. Do you have a tendency to hold on to clothes you no longer wear? If so, you aren’t alone. We all keep that pair of jeans that’s a size too small or the jacket that went out of fashion sometime in the 90s. However, if your closets are on the small side, keeping those extra articles of clothing could be turning your home into a disorganized mess. So, take a good hard look at the contents of your wardrobe and toss anything that hasn’t seen the sunlight in a year. If your closet is on the small side, you might be wondering where to hang your jeans collection or store your winter clothes during the summer months. The answer is to look up. Rather than stuff your clothes into a less-than-roomy closet on hangers, aim to make use of vertical space by adding a divider to your upper shelf. By creating cubbies out of this area, you can maximize space and make it easy to store folded clothes, shoes, and even handbags. And for best results, move off-season clothes to a different location, such as under the bed or in the attic. Plastic storage tubs are great for protecting these items from the elements – and pests like moths. If you have an abundance of bulky winter wear, consider stowing these items in vacuum-sealed bags to reduce their size. As a bonus, when you unpack these items each fall, it will feel like you’re getting a whole new wardrobe. If your itsy-bitsy closet makes you long for a swoon-worthy walk-in, don’t get depressed; a few changes can make even the most cramped closet feel more inviting. Add interest to small closet spaces by covering the walls with removable wallpaper. 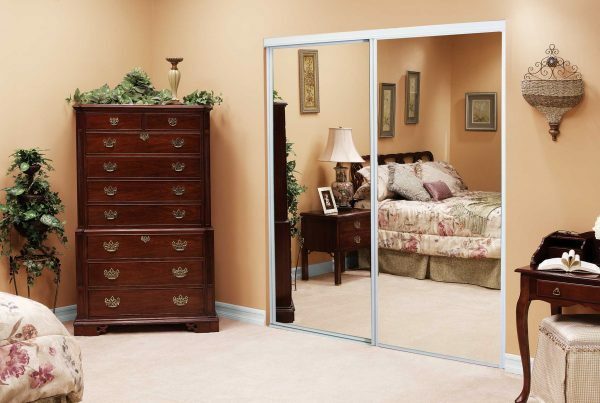 You can also mount a mirror on the wall or door to create the illusion of space. Finally, switch out that bare bulb for some more luxurious lighting. The end result will be a closet that you can’t wait to come home to rather than one you avoid. Ready to give your tiny closet a massive makeover? A leader in closet solutions, we offer accessories and finishes for every room in your home. To learn more about what we can do for you, call today or contact us online to schedule your free consultation. We look forward to helping you organize your life.